Shooting of Kannada version of 'Dirty Picture' came to a gyrating halt on Thursday July 5, thanks to the thousands of Veena Malik fans who mobbed her at Majestic, Bangalore. Around 20,000 fans of Veena Mallik came to have a glimpse of her which led to traffic jam in Banglore city. When the situation got out of control, the producer called the police to handle the fans. People stood on flyovers and footpaths in the area to watch Veena malik's majestic view. The Bangalore police had a hectic time in making seating arrangements for the viewers. Veena flashed a rare smile instead of her typical "veena malik" pose to the dozens of fans and signed a few thousand autographs. Meanwhile, seeing this two MaDa Bulls Fought on street, amusing traders, Scares Investors. Day traders had an amusing half-an-hour, as two bulls locked horns in the middle of the road. Even as traders watched, the bulls fought ferociously, even getting gravely injured in the process. They also pushed nearby three satta exchanges, causing them minor damage. While it was an entertaining sight for those watching from a distance, many who were trading, like small investors, brokers and others, panicked. Trading was stalled for sometime. For some time, efforts to break up the fight and chase away the bulls did not yield any result. The Finance ministry people tried everything they could, including throwing Money in buckets in the fight, but to no avail. Finally, gushing 'spirit'ual water from a Mallya Mamma's Brewery building nearby was aimed at the "chargedup" bulls, which finally chased away the bulls in different directions and ending the half-hour of amusement. Unidentified Foreign Onlooker (UFO in short) said "Its stock market supremacy street fight. Nifty and Sensex are fighting for supremacy." 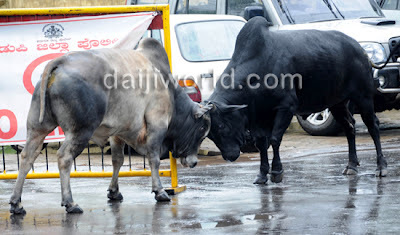 While another onlooker said, its PA SangMa and Pranab Da fight (MaDa in short ), that's why these MaDa Bulls were fighting for on street for practice before actual presidential polls. while query to God by jaggu has gone unanswered, it have been long wondered whether animals have feelings, feelings of pain, sorrow, happiness, and grief. These questions have not gone unanswered to Scientists and psychologists surprise, who said that usually a group of bulls will sort things amongst themselves and don't fight much. But introduce a cow, and then there is trouble. This clearly shows that animals have feelings, they loved to be caressed, coddled and stroked and possibly they would like to communicate to us but unfortunately our languages don’t match. But Animals emotional awareness is much stronger than humans, thats why animals can show their love and emotions to humans. Just to reflect on the story of God’s creation, God on the fifth day, created animals of all sorts. He blessed them and made them multiply and fill the earth. And on the sixth day, God created humans, first he created man, took some rest after seeing creation for his ingenuity and unique master piece and then after sometime God created woman, from then on, no God and Living being took rest.